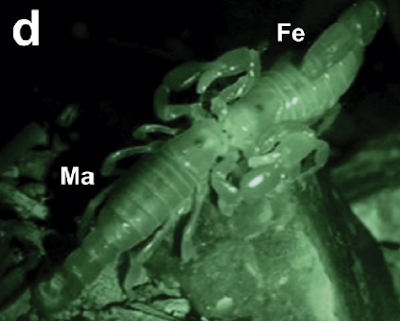 Paola Olivero and co-workers have recently published a study of the mating behavior of two allopatric populations of the Neptropical scorpion Bothriurus bonariensis (C.L. Koch, 1842) (Bothriuridae). The authors found significant differences in mating patterns, including differences in the frequency and duration of important stimulatory courtship behaviors. Another interesting finding was that most inter-population matings were unsuccessful. Courtship and mating behavior generally evolve rapidly in diverging populations and species. The adaptation to different environments may cause behavioral divergence in characteristics involved in matechoice. Our objective in this study was to compare the sexual behavior of two distant populations of thescorpion Bothriurus bonariensis. This species has a broad distribution in South America, inhabiting Central Argentina, Uruguay and south-eastern Brazil. It is known that in this species there is a divergence in morphological patterns (body size, coloration, allometry and fluctuating asymmetry indexes) among distant populations. Considering the differences in environmental conditions between localities, we compare the sexual behavior in intra-population and inter-population matings from Central Argentina and southern Uruguay populations. We found significant differences in mating patterns, including differences in the frequency and duration of important stimulatory courtship behaviors. In addition, most inter-population matings were unsuccessful. In this framework, the differences in reproductive behavior could indicate reproductive isolation between these populations, which coincides with their already known morphological differences. This is the first study comparing the sexual behavior of allopatric populations of scorpions; it provides new data about the degree of intraspecific geographical divergence in the sexual behavior of B. bonariensis. Vorherige News „Trockenbrut“ über Wasser oder feuchtem Substrat?